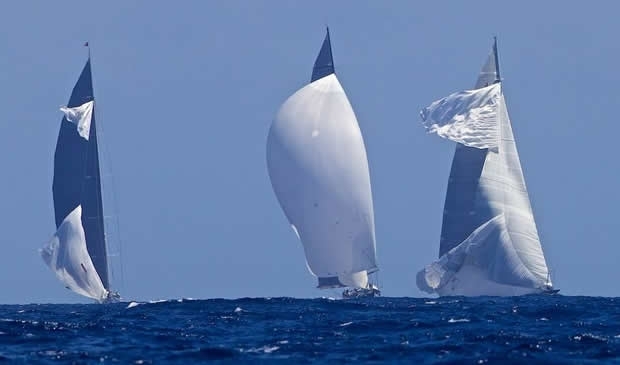 Another splendid day of sailing took place today at Menorca Maxi as the nine Wallys and three J Class yachts held a 32.5-mile long coastal race which saw them battle it out along the southern part of the island. Conditions were once again ideal, with the breeze between 10 and 15 knots, starting from the east and veering to the northeast for the second half of the race. Crews and tacticians were kept in their toes and the four hours of sailing on Menorca's blue waters saw a number of lead changes in the Wally class. The first part of the race consisted of a 2.8 mile long beat that was decisive in the Wally Class. The 12 boats then had a long run, passing the Isla del Aire lighthouse before rounding a mark off Cap D'en Fent, on the southern part of the island. The return leg was then a long beat to a final windward mark before finishing off the entrance to Mahón's bay. It was a 'Magic' day in Menorca for the Wallys. Magic Blue maintained her winning streak and pocketed another victory, the second in four races, as well as winning the Gino Bossi Trophy, awarded to the first classified in the coastal race. Antonio Cacace's boat set the pace off the start and rounded the first weather mark in the lead, on corrected time, followed by J One (the original Magic Carpet Wally). Two boats had a tough start in the first leg. Galma got shut out of the starting line at the committee boat end while the WallyCento Open Season had to completely change their plan after rounding the mark as they were unable to hoist their A3 and lost almost six minutes to Magic Carpet3 in real time. The long run to Cap d'En Fent confirmed the downwind speed advantage of Magic Carpet3, as Sir Lindsay Owen-Jones' WallyCento clawed her way back against the smaller boats in corrected time. The long upwind stretch to the windward mark off the bay propelled the Wally80s to the forefront as tacticians played the 40° wind shift. However, it was again Luca Bassani, founder and CEO of Wally, and the rest of the Magic Blue crew that proved to be the most consistent. Always in the top three, on corrected time, the Italian boat was the third to cross the finish line and her victory in corrected time stretched her overall lead over second-placed Magic Carpet3 to seven points, before the two windward/leeward races scheduled on the final day. Jens Christiansen, tactician onboard J One, talked about the team improvement and their second place in the coastal race: "We were very satisfied with our fourth place in the first day. We were quite unhappy though yesterday with a sixth and a seventh, getting beaten by our friends. Although we had sailed quite well, we felt the boat was very slow downwind. We worked on that and today we tried a new spinnaker that worked much better. "Everybody was extremely focused on boat speed, we had a very good start and got two nice shifts in the first beat. In the long run we managed to make more gains, especially before the last mark. We then stayed focused and sailed well back to the finish, staying in touch with the left shift." Ross Macdonald, tactician onboard the other WallyCento, Open Season, commented on the day's performance: "The wind was a bit shiftier than what we expected, especially when we rounded the first mark and headed towards the south side of the island. Then, on the way back it got really shifty. "We had a problem with the furling of the A3. It was ready to go up but unfortunately something went wrong with it and as a result we had to switch to another sail. It was a full change after the first mark. We then got going again and the rest of the race was perfect. "There is no question that Magic Carpet3 is a faster boat and in fairness the team is better too. We are still learning and our objective over the next few years is to keep improving, hoping to match their level in the future." There was a change of pace for the J Class yachts today. With slightly stronger breeze than the previous two days, at around 10-14 knots, this time from the northeast, there was also a larger swell to contend with at the start of the race. Hanuman had clear plans to head right up the first beat, and took the committee boat end of the start line right on the gun at full pace. Lionheart tacked over to the right shortly afterwards, while Ranger split to the far left of the course. When the three yachts converged at the top mark it was Lionheart, just in front of Hanuman with Ranger close on their tails. The strong swell saw Hanuman and Ranger split their spinnakers in unison on the first downwind run as both yachts simultaneously hit large waves, however both teams recovered quickly. At the gybe mark, Hanuman performed a neat gybe-peel and headed close inshore along the rocky shoreline to Cap d’en Font. Ranger closed down the run, until Hanuman just pulled away by the leeward mark to round 42 seconds ahead. Lionheart, which has been demonstrating superb upwind pace this regatta, held her advantage on the second long windward leg, and rounded the final top mark 2 minutes and 20 seconds ahead of Hanuman, maintaining her lead easily to the finish. Hanuman took second and Ranger third. Murray Jones, tactician on Ranger, commented after racing: “We didn’t get a great start, and that put us on the back foot straight away. We ended up a bit sandwiched between Lionheart and Hanuman, and then we had to tack out of it. “But we recovered from that, and then we blew out our spinnaker on the first run – right at exactly the same time as Hanuman did – but we had a good tussle with Hanuman all the way down the islands to the turning mark. But unfortunately they just rolled around our bow and we couldn’t hold them, so they went round a couple of lengths in front of us and then made it difficult for us all the way back up. It was a long port tack with short starboards, and they tacked on us a few times and that dropped us back a little bit, so it was just a bit tough! “The competition has been great, really close racing. Today even though we had a bad start we actually had a pretty good first beat once we got clear and it was pretty close at the top mark between the three boats. “We made a few little errors today. It’s such a fine line because the boats are quite even in speed you just can’t afford to lose a boat length, but we’ll see what happens tomorrow.